East London is the capital for pottery classes, pottery markets and beautiful studios. East London is famous for its maker's community, with regular events celebrating it. It is also home to the likes of Hackney Wicked, Urban Makers East and the redevelopment in Olympic Park, Here East that are huge makers hubs dedicated to inspiring creatives and makers alike and giving them an accessible and affordable place to create, work and teach. Pottery has seen a huge rise in recent years, and we are proud to be working with East London's incredibly talented ceramicists and potters to bring you the best selection of pottery classes East London has to offer. This taster pottery class is taught by one of East London's most talented potters. Edit Juhasz, designs hand thrown porcelain table-wares. She has always been fascinated with functionality and shapes. She throws the porcelain thin, to emphasise the beauty of the body. She likes to create comfortable forms for everyday use. This weekend pottery course is perfect for beginners who want to learn how to throw and trim a pot on the pottery wheel. The course is run by Suzan, a professional pottery artist. Suzan fell in love with clay in her early teens in Turkey but didn't have the chance to get her hands dirty until after she came to London and enrolled to a part-time course in 2004. After finishing her BTEC certification classes in Kensington and Chelsea college Suzan finally opened her own studio in Plaistow where she designs and creates all of her work which is inspired from her mixed family background. These 2 hour pottery classes are intensive lessons designed to troubleshoot recurring issues in your wheel-throwing or deepen your knowledge of the process on to one basis. Jo Davies is an expert in her field and respected professional ceramicist. She also loves to teach people to throw and share her knowledge and has taught many students to unpack and solve problems that are recurring in their own throwing, such as issues with centering and pulling up the clay or warping and cracking. If you've always wanted to have a go at throwing then this pottery class a good place to start. This session is 2 hours long and is designed for two people so is a great shared experience for two friends or a couple. One of our tutors will teach you how to create a simple cylinder shape that you could use as either cups, flower pots or for serving food. Your tutor will use demonstrations, discussions and hands-on assistance to guide you through the process. The Jo Davies Studio is a professional studio set inside the Chocolate Factory Workshops in Stoke Newington near Dalston. It is a beautiful environment for learning and secret London gem. 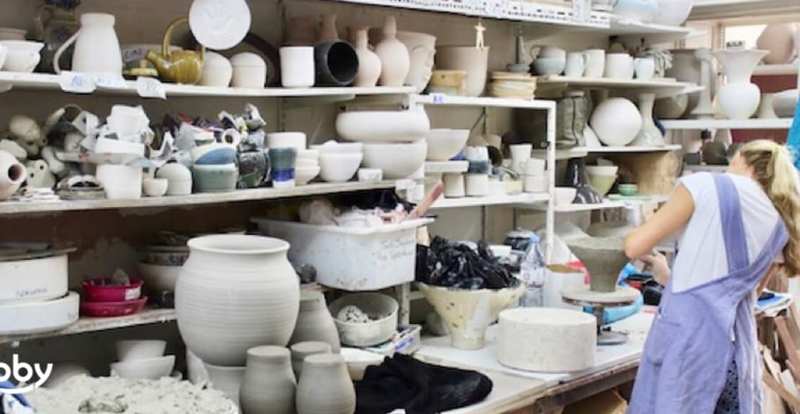 This pottery class in East London completed in one-day introductory class, where you will learn the very basics of throwing on the potter's wheel. This will include weighing and preparing balls of clay before you start, then the basics of the wheel - from centering your clay, pulling, shaping and working with your tools, beginning to learn the techniques of throwing bowls and cylinders. This is a fun and quick way to introduce yourself to throwing on the wheel and is suitable for complete beginners.